Super Metroid: GBA Style! 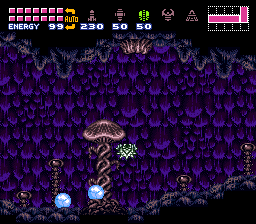 is a hack of Super Metroid which main goal was to be able to combine the Project Base and Control Freak hacks into a single, fully functional hack. 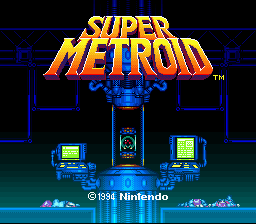 Additionally, this hack aims to make the gameplay experience of Super Metroid as closely as possible to that to Metroid Zero Mission and Metroid Fusion in both controls and physics. To perform the special Charge+Beam combos, tap the button assigned to Run when the charge is full and you have the appropriate Beam selected! Missile doors now require only 1 missile shot to be opened like in Zero Mission / Fusion, instead of the original 5 from Super Metroid. Run is now toggleable between Run and Walk. Moonwalk has been deleted, and the setting is now used to toggle Auto Run. Aim Up is now the only aim button, ‘Aimlock’. Holding it will make Samus aim at a certain angle, and aim higher or lower if you tap up or down. Samus also has the ability to run and aim straight up at the same time now by using Aim-Lock + Up, you can go back to diagonal aiming by pressing Down while still holding Aim-Lock. Select Item is still used to select missiles, super missiles or the grapple beam. It no longer selects X-ray nor Power Bombs; X-Ray now has its own button and Power Bomb is highlighted automatically when in Morph Ball and pressing Brandish. Beams can still be used at any time, even when missiles and super missiles are selected. Item cancel has also been removed, as it now activates the x-ray scope. Aim Down has become Brandish, which, when held, will toggle between Beams and the item currently selected. This is somewhat… abusable. Powerbomb attacks are also now easy to control, just tap Brandish when you want to trigger them while in Morph Ball. Spinjump controls have also been improved a bit - Walljumping should be a bit easier on a d-pad, and Samus will fire in the direction you’re pressing instead of just forward, if you press fire. The controls are configurable to ANY combination. Aim is not limited to L and R.
QUICK MORPH – hold X-Ray + press down to instantly morph while in air. New HUD changes: Missiles selected will be highlighted in GREEN. If you press Select, Super Missiles will be in GREEN while normal missiles will appear in grey. Pressing Select again will highlight the Grapple Beam in GREEN. 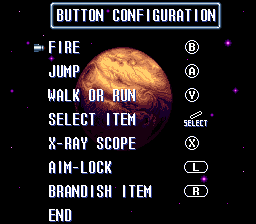 Only when the Brandish button is pressed, the selected item will change its icon to YELLOW. The same applies for Power Bombs, they will always be highlighted in green, and only when Brandish is selected they will be YELLOW. New Run code: sylandro made a new Run ASM code to make the Running of Samus much more similar to that of Zero Mission and Fusion. If you have Auto-Run enabled, Samus will now wait some time until she starts gaining up speed into Boost, similar to the following entries on the franchise. This new code is available in the Super Metroid - GBA Style (New Run).ips patch, while the other one will have the original Speed Boost and Run gameplay of the original Super Metroid. With two great improvements combined, this might just be the best way to experience Super Metroid! My only reservation is that the heavier physics are a bit *too* heavy. The faster jump speed demands a level of precision well beyond the original game, which won’t be a problem for veterans, but makes it harder to recommend to first timers (or those who have gotten a little rusty). The original game’s jumping is quite floaty, but a less dramatic speed change would be optimal.